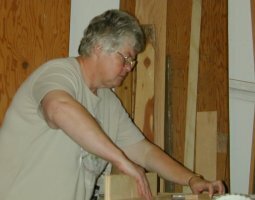 In the Spring of 2002 Jenny decided to she would like to try woodworking. Charlie jumped at the excuse to get all those extra tools he had been wanting... The results are starting to show. The more recent projects are at the top, but if you start at the bottom and work up you will see the excuse for each of the new tools! This was the year of the big change...people outside of the family wanted furniture made, for real money. 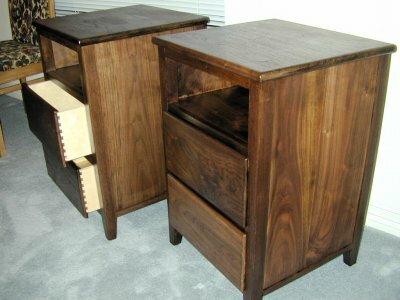 Eight pieces of furniture were made for other people over the course of the year, including a sale only a few days after the woodworking web site was set up. 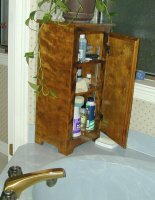 See the "Public" Woodworking page for descriptions and pictures of the more recent projects. For Christmas Mark got a custom-made bed and chest of drawers to go with the night stands delivered earlier. 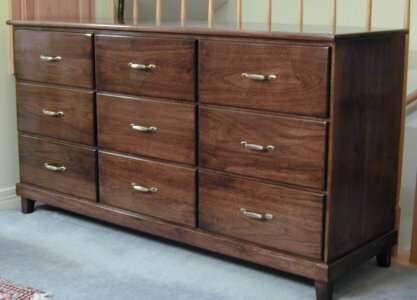 All were made from solid American Black Walnut, with Baltic Birch drawers. The dresser and mirror will finish the bedroom set. Believe it or not, the dresser (at the right) is almost done. And here is the final product. Assembled less than a week later, and finished two weeks later, ready for delivery to Mark. We are jealous, and are thinking of building a set for ourselves. All the hardwood projects have left some small pieces of wood. 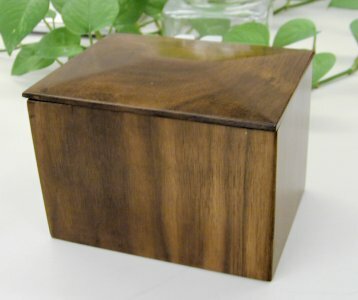 What better to do with it than make some small boxes? When Jenny's sister Cathy visited recently they found a doll-size porch swing in a store. Cathy loved it. Cathy was also interested in woodworking tools, so made this swing. Of course the one in the store was simple pine sticks stapled together. And the one Charlie helped her make out of cedar had glued half-lap joints, rabbets in the slats, etc., but it did come out nicely. 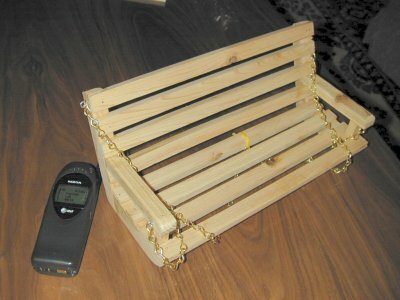 Remember that this is a doll swing - see the cell phone in the picture for scale. We wanted to try working with MDF - Medium Density Fiberboard - a man-made forest product good for inside use, either as a base for wood veneer, or for paint. Jenny's brother Jim recently finished his medical residency, and has moved to Decorah Iowa with his family. 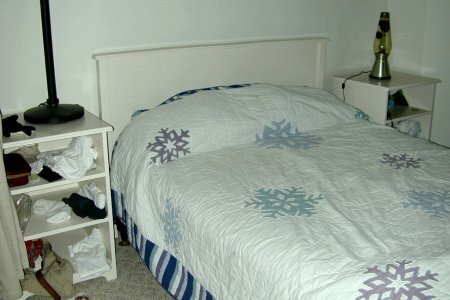 We don't want to complain, but their guest room furniture wasn't - they only had a mattress, frame, and cardboard boxes. So we built them a simple guest room set out of MDF, with two night stands (no drawers where guests can forget things) and a headboard. And we drove to Iowa to check out their new house ... ah .. to deliver the furniture. So we must confess that the latest woodworking accessory was a Honda Odyssey minivan. 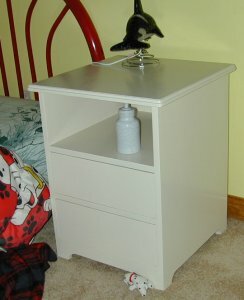 We also built a night stand with drawers for each of the kids - Jackie, Katie, and Daniel. The kids ordered special knobs which hadn't arrived, but that didn't keep them from putting the stands to immediate use. 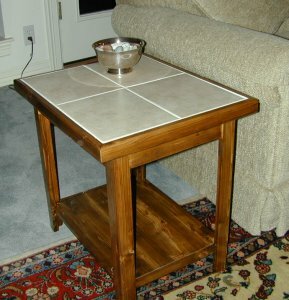 During this project it became "necessary" to change from a radial arm saw to a table saw. A big one with 12 inches to the left of the blade, and a 36 inch table to the right. And the Radial Arm Saw hasn't gone away yet! What do you do with all the "stuff" that accumulates around a bathtub? The shampoo, soap, skin treatments, etc? Jenny designed and built a cabinet - birch plywood but with solid birch strips around the edges, and a solid birch face frame with half lap joints. It was the first project of her own design and construction, only using Charlie as an advisor. It came out great! 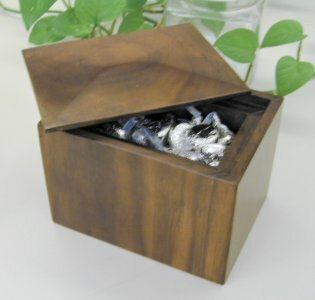 Jenny and Charlie wanted to try working with premium hardwood - specifically American Black Walnut. Mark has a sucky nightstand. 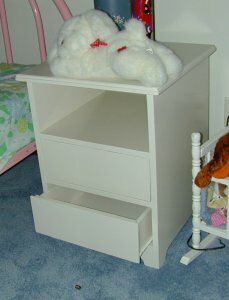 So we built some nightstands for him (that became the start of the bedroom set, above). At this point they only had first coat of varnish. Mark wanted a shelf at the top, for TV remote controls, etc., rather than the usual drawer at the top and shelf below. 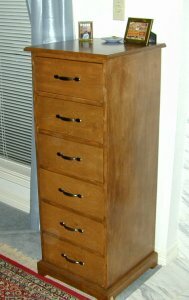 Jenny has also been wanting a Lingerie chest to supplement her dresser. 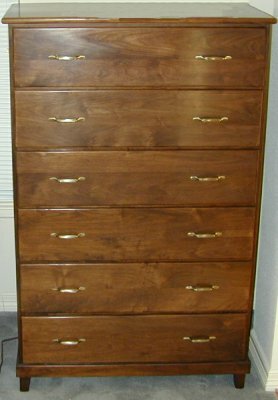 So while she was out of town, Charlie started a new chest (merely Birch plywood) as a surprise. Jenny helped him finish it, and did the staining and varnishing. 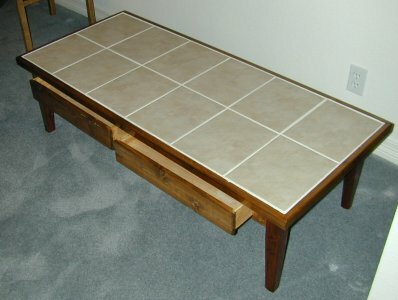 The first joint project was a coffee table and end tables for Mark. Because we didn't (yet) have a biscuit cutter to make up a hardwood top, we used plywood with ceramic tiles for the tops. 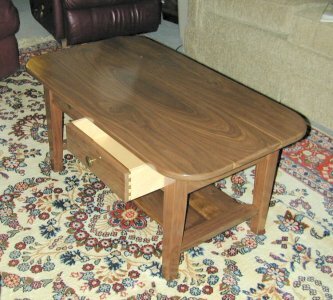 The coffee table has a couple drawers for the "remote controls." Building it "required" a new Ridgid 6 1/2 inch jointer (planer). We made two identical end tables to match the coffee table. 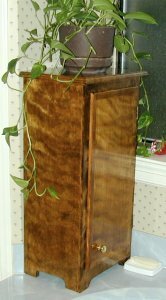 The biscuit cutter came after the tops were designed, so look at the neat shelf at the bottom of the end tables. The Porter Cable biscuit cutter (plate joiner) is great. The next project was a pair of patio tables, largely designed by Jenny after watching Norm Abrams and the Yankee Craftsman on TV. Built from unfinished cedar so it will age nicely in the weather. Part way through this project we decided we needed a surface planer (Delta 12 1/2 inch thickness planer) and stationary sander (Delta, 6 inch disk, 4 inch belt). After the first pair of tables, we built a third one. 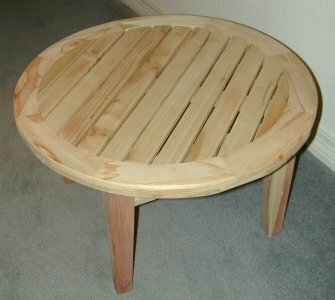 The circle for each table was made up of 16 pieces of wood, joined together. But we used simple fence board cedar, planed smooth. Jenny cut and fit all the lattice slats using the planer, sander, and a relatively new jigsaw, replaced with a band saw by the third table. She even used the pneumatic nail gun to hold the slats while the glue dried. Legs include hand cut mortise and tenon joints - not just biscuits. 16 hand-cut mortises for two tables led to a blister on the palm of Charlie's hand. Which ultimately led to a drill press with mortise attachment. Jenny didn't like the high price of wind chimes in the stores. So she did some research on the Internet. They are really complex - length to 1/16 inch to be sure they are in tune to make nice sounds together. Hanging at 1/6th of the length (a node in the vibration). With pipes next to each other that will sound good when rung together. Wind chimes now seem cheap. The most fun came as she carried the 10 foot length of conduit out of the store. "Going pole vaulting" the guard asked. "No jousting in a Lexus" said the person parked next to us, as we pulled out with the pipe sticking out of the window, under Jenny's arm. "En Garde" said another, taking a fencing sword stance. Our house is now 12 years old, and the orange and tan trim needed painting. Only the trim, but it still took over 4 gallons of paint. And a 40 foot extension ladder. Fully extended. Charlie did it (he is too cheap to hire someone, despite Jenny's pleading). Jenny learned new prayers while Charlie was on the ladder. But it is done. And we have a heavy duty 40 foot ladder (it weighs about 80 pounds) if anyone needs one. 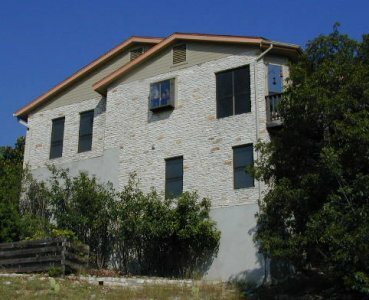 As everyone knows, our house is on a hill. A really steep hill. And where some people would have grass, we have stones. Round slippery stones. So walking around the house has been an adventure. The builder put three stone steps down from the main level, then gave up. 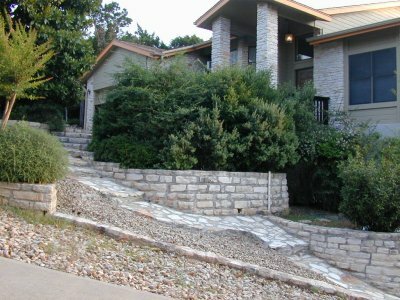 We are continuing the stone sidewalk - eventually around the house, but so far, it takes us through the steepest part in front, to the side of the house. A couple tons of rocks and 7 bags of mortar mix, and we are about 1/3 done.